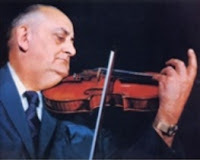 Alfredo Campoli (also known as Campoli) was an Italian (some would say English) violinist born on October 20, 1906 (Heifetz was 5 years old.) He is remembered for the exquisite, sensuous tone he drew from the violin as well as the span of his repertoire. He began violin lessons with his father, a teacher at the Santa Cecilia Academy in Rome, at age 5 (some sources say age 6.) His family moved to England in 1917. He made his London debut at Wigmore Hall in 1923, though he had already played publicly in London - and entered several competitions - from age 13 and had been playing professionally since then. In the 1930s, he formed the Salon Orchestra and the Welbeck Light Quartet in order to make a living during the Depression, playing in restaurants, hotels, and small halls. He concertized only sporadically during this period. After the war, he re-established his concert career. His U.S. debut came in New York in 1953. On that occasion, he played Lalo’s Symphonie Espagnol with the New York Philharmonic under George Szell. He toured Russia in 1956 and continued touring the world until his retirement. During his 55-year career, he played in over 1000 radio broadcasts and made more than 100 recordings. He also appeared in several films. Arthur Bliss wrote his violin concerto for him and he premiered it in 1955. There are many soundtracks of his playing – no videos yet - on YouTube. Campoli played an 1843 Rocca and the Dragonneti Stradivarius (1700). He died on March 27, 1991, at age 84.